UCLA finished with a 198.075, and Michigan edged out Alabama by 0.050 with a 197.725. Alabama ended in third with a 197.225, while Nebraska was in fourth with a 196.650. The Bruins began the meet on beam, and Grace Glenn led off her team on the event and the meet but fell. 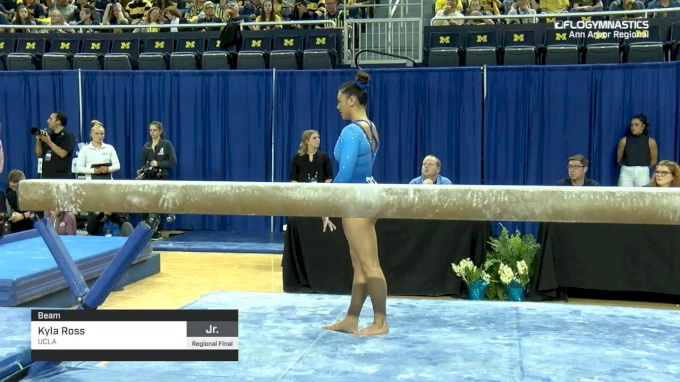 Luckily, the remainder of UCLA's lineup hit its routines, including a perfect 10.0 from Kyla Ross in the anchor spot. Despite a fall to start, the Bruins were just 0.025 shy of the lead at 49.400. They moved onto floor and counted all scores above 9.900 to maintain the lead halfway through. UCLA kept its momentum going on vault and counted scores of 9.850 or above to to keep the lead. The reigning national champ finished strong on bars, including another perfect 10.0 from Ross and all counting scores above 9.900. The Wolverines started on bars with a consistent performance. All routines scored 9.800 or higher, and Lauren Farley led the lineup with a 9.875. Michigan's bar total of 49.200 put it in third after the first rotation. Michigan improved on its performance with a 49.425 on beam, earning scores of 9.850-9.950 with the high coming from Natalie Wojcik. Halfway through, Michigan moved up to second in the standings behind UCLA and ahead of Alabama. In the third rotation, the reigning Big Ten champion continued to improve its team totals and scored a 49.450 on floor. Every routine Michigan counted was above a 9.875, and Abby Brenner, Olivia Karas, and Emma McLean tied to lead the team with 9.900s. Michigan was a bit tentative on its final event of vault, giving away tenths on its landings. It still scored fairly well, scoring only 9.825s and 9.850s. The Wolverines' vault performance was good enough to stay ahead of Alabama to finish in second and advance to nationals. Alabama had strong performances on beam and floor, each with event totals of 49.425, including three 9.900 floor routines and three scores above 9.900 on beam. However, Michigan was just slightly better today and beat Alabama to qualify to nationals. Nebraska had a good final meet of the season but had a few mistakes on bars and beam, despite not counting those scores. But the Huskers' scores just weren't high enough to contend for a spot at nationals. 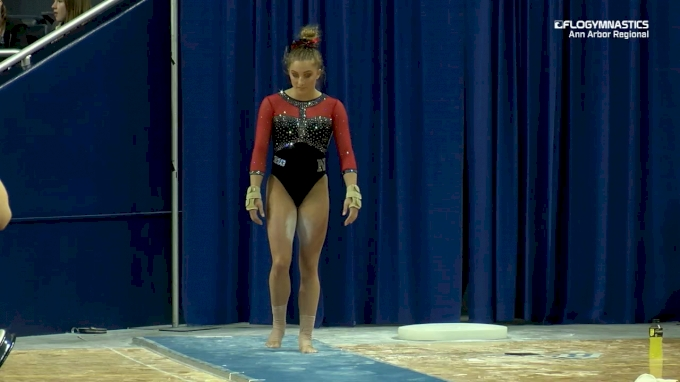 Although Nebraska ended its season today, Taylor Houchin joined UCLA's Kyla Ross, Nia Dennis, and Pauline Tratz to earn the top vault score of the night with a 9.900. Houchin competed a strong Yurchenko 1.5 with lots of distance and excellent form and had just a small hop forward on the landing. For the tenth meet in a row, Ross earned a perfect 10.0. Her vault wasn't perfect today like it was yesterday, but both her bars and beam routines were. Ross' UCLA teammate and fellow Olympian Madison Kocian was near-perfect on bars with a 9.950, and five gymnasts scored 9.900. Beam saw several scores above 9.900. Wojcik and Alabama's Lexi Graber were close to perfection with a 9.950 while Alabama's Emily Gaskins and UCLA's Katelyn Ohashi earned 9.925s. Ross, Ohashi, and teammate Gracie Kramer were all phenomenal on floor with Ross and Ohashi scoring 9.950, while Kramer scored 9.925. A whopping nine gymnasts earned a 9.900 on floor.